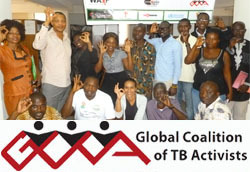 The GCTA is a coalition of TB affected communities and their representatives aiming to bring together activists from diverse backgrounds and regions to ensure TB affected communities are at the center of all processes on TB. The GCTA aims to develop regional, national and local alliances for collaboration with all stakeholders. The Stop TB Partnership (STBP) is a unique international body with over 1 000 partners, and strives to bring these diverse stakeholders from all over the world on a platform to unite in the fight against tuberculosis (TB). Stop TB Partnership, since its inception has strived to engage with communities and civil society organizations to ensure that the patient perspectives are reflected in the decisions and policies. To realize this vision, the STBP has two community representatives on the Coordinating Board (representing the Communities Constituency) and two community representatives on each of its seven Working Groups.